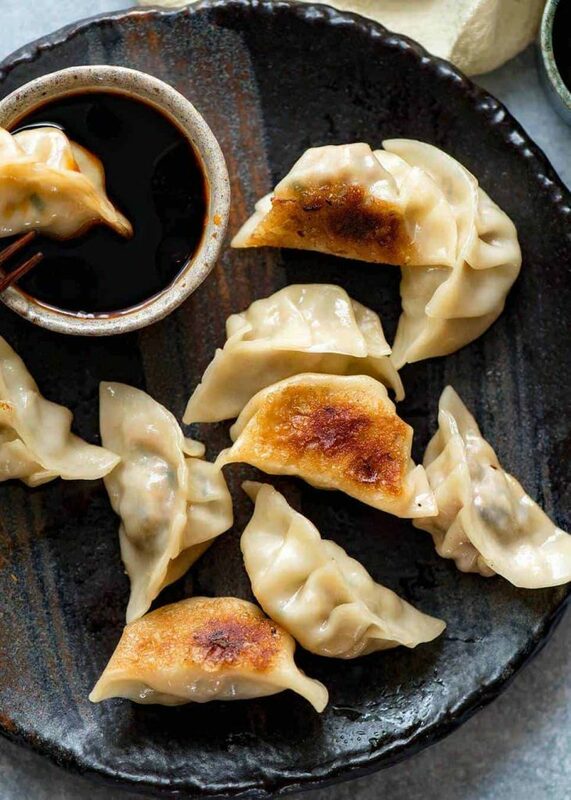 Our advice is to make these potstickers with store-bought wrappers, it really simplifies the process. While making the filling is very easy, getting the pleated fold is mildly tricky. You will also need a few tablespoons of safflower, peanut or other vegetable oil for pan-frying the potstickers. Mix all the ingredients for the sauce together and let sit at room temperature while you make the filling. In a large bowl, mix all the ingredients for the filling together until well combined. Let the mixture sit for at least 30 minutes. Fill each wrapper with a scant tablespoon of filling. Close each one into a half-moon, making sure there are no air pockets. It is probable that some of the filling will smoosh out the ends as you seal them — this is normal, just drop it back into the bowl with the rest of the filling. If the wrappers are dry, get a little bowl of cool water and wet half of each wrapper circle with the water; this will help it seal tightly. Pleat the edges: Start from the center and do 3 pleats on the left of the dumpling, then another 3 on the right of the dumpling, As you make the pleats, settle the dumpling on your work surface so it sits flat. You will need this flat surface to get a nice crispy bottom to your potsticker. Set each finished dumpling on a baking sheet lined with either parchment or a little semolina flour or corn meal. To cook your potstickers, get a large, non-stick frying pan out and heat about 2 to 3 tablespoons of vegetable oil over medium-high heat. When the oil is hot, lay the potstickers down in one layer; they can touch each other. Fry like this 1 to 2 minutes, until the bottoms are browned. Add enough water to come up about 1/4 inch. The pan will sputter and spit, so have a lid ready. Turn the heat down to medium, cover the pan and cook for 6 minutes. After 6 minutes, move the lid partway off the pan to let steam escape. Cook 2 more minutes, then remove the lid entirely. You will soon hear the cooking change from boiling to sizzling — that’s your cue they are done. Serve immediately. We recommend that you serve with a soy dipping sauce! Tag us in your recipe creations – #huntsns or @huntwyo. For information on any 2019 hunt, click here. This recipe was inspired by honest-food.net.